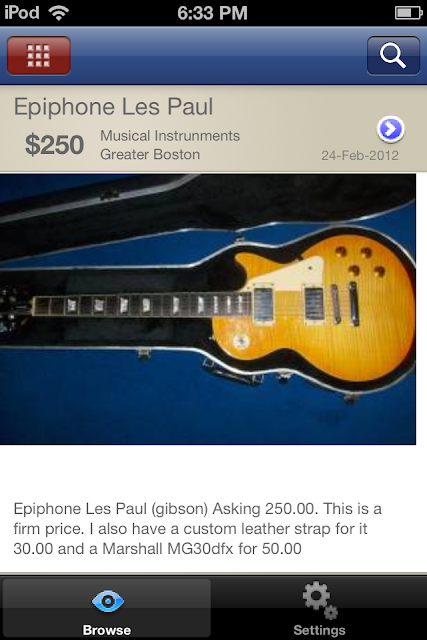 This looks a lot different than what you typically see on the PC/Web version of Craigslist. In addition, the experience of browsing listings on a mobile device using Invantory is really unique. Instead of looking at text lists and using search engines, the focus is on photos. This helps people quickly determine what is of interest, and also helps them evaluate quality. Future versions of the Invantory Craigslist app will do lots of other things, including creating classifieds and distributing the listings elsewhere. Has it been tough building an app? For my partner Sam, it has been extremely time-consuming, with many technical hurdles to overcome. Are we nervous about the launch? Absolutely. Are there ups and downs associated with running a startup? Every week I am on a startup roller coaster. But nevertheless we are making progress and are really looking forward to what matters: Whether or not people will like using the app. We hope you can try the app and let us know. Download the app via the Invantory website, or sign up to be notified by email when it launches.